Cast members Nael Nacer, Gigi Watson, Sam Simahk, Celeste Oliva, Kerry A. Dowling, and Barlow Adamson. 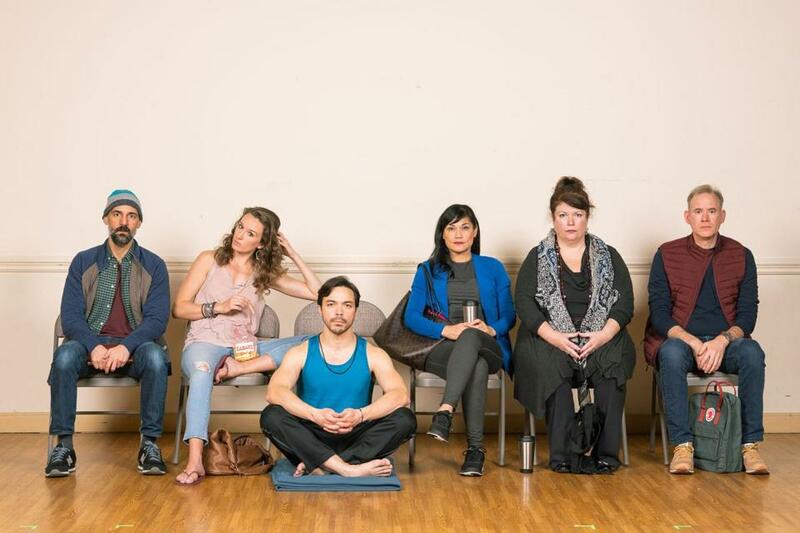 A play about six people at a silent retreat might seem like an odd subject, especially since most of the spoken word is limited to the voice of an unseen “teacher.” But playwright Bess Wohl, whose “Small Mouth Sounds,” opens Jan. 4, says she thought of it as a mystery. Wohl says the arc of her comedy — while not exactly traditional — follows the natural trajectory of a five-day retreat. For director M. Bevin O’Gara (“Tribes,” “Clybourne Park”), “Small Mouth Sounds” marks her first return to SpeakEasy since taking over as artistic director of the Kitchen Theatre in Ithaca, N.Y. Wohl’s script, she says, is forcing her to think differently about her approach to directing. Unlike most plays, in which the actors on their own develop a back story for their character, Wohl provides detailed character descriptions to orient the actors to their roles. While “Small Mouth Sounds” is light on dialogue, O’Gara says the pacing is swift and intense. And she says costumes and props communicate lots of information about who these people are, and how different they are from one another. Playwright Wohl says that when audiences come to watch a play, they take a vow of silence for the time when the lights go down. On the second floor of a nondescript office building in Needham, adults and children — many dressed in pajamas — are slipping off their shoes and stepping into a warmly lit room full of youth beds and cribs. Audience members select a comfy spot, where a beautifully hand-crafted black cloth rabbit is resting, and settle in for a charming dramatization of Kate DiCamillo’s “The Miraculous Journey of Edward Tulane,” presented by the Arlekin Players Theatre through March 3. The 90-minute production employs the simplest effects to bring to life the story of the arrogant, if exquisite, porcelain rabbit who only learns the power of love and human connection through a series of misadventures with a fisherman and his wife, a hobo and his dog, a young boy and his sister. Golyak says “Miraculous Journey” is very popular on stages in Moscow, where three or four productions are currently running. He wanted the Arlekin Players’ production to be unique, so he reached out to his friend Alexander Huh, a director in Moscow, who developed a new adaptation in collaboration with designer Nastya Bugaeva. She created the rabbits that rest on each of the beds, along with the truly magnificent rabbit mask worn by Eric Andrews, who plays Edward Tulane. The bedtime story is brought to vivid life with the simplest of effects and with language that moves between Russian and English without missing a joke or poignant moment. For tickets, go to www.arlekinplayers.com.